Dreaming of a brighter, more even smile? We can make your dreams come true! We are trained and certified in cosmetic dentistry and have helped so many of our patients from Fonthill and the surrounding areas shine bright with the smile they’ve always dreamed of. Our cosmetic dentistry services are highly specialized and individualized. Each treatment plan is custom tailored to the look you seek. Whatever you desire—whiter teeth, a more even smile—we will do our utmost, within your budget, to help your dream come true. Our commitment to excellence means we use the most advanced technology available to address diverse cosmetic dental issues such as crooked teeth, permanent stains on teeth, spaces between teeth, and chipped and broken teeth. Our dentists engage in constant continuing education to fine-tune their skills and to learn the latest techniques. Rest assured that Foothill Marketplace Dental always strives to bring you the latest and greatest in cosmetic dentistry. Porcelain veneers, also known as laminates, involves the placement of paper thin shells of porcelain to the front of the teeth. 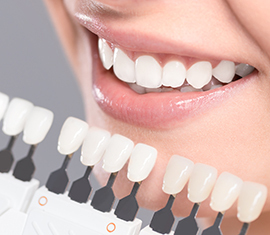 Commonly used on front teeth, veneers can enhance and beautify your smile in as little as two visits. 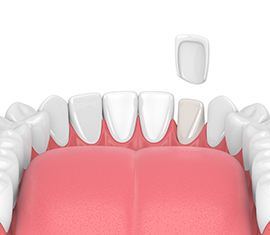 Veneers are made just for you, and can change the shape, size, and color of your teeth. To fix cosmetic issues such as chipped teeth or spaces between the teeth, a composite bonding material (similar to ‘white fillings’) is fixed to the exterior of the tooth, essentially rebuilding the tooth.. We also use composite bonding to permanently mask discoloration on teeth. Procedures involving composite bonding are relatively simple and quick, generally involving just one visit. Since bonding is applied to the surface of the tooth, it doesn’t interfere with the original structure of the teeth. However, there is some maintenance involved with bonding, and patients must be vigilant in cleaning, brushing, and flossing to maintain the look of the composite. We want to work with you to restore your smile to its most beautiful. Want to learn more? Book a free no-obligation consultation with one of our experienced dentists.